As you know, this blog is called The End Time, because we are in the end time. This is the period between Jesus’ first and second comings, where He is building His church. When His church is complete, He will call the Church home. It take it as a duty given by command in the Bible to be fervent with His message, since His return is (always) imminent and our duty then shall be no more. Redeem the time and act with eagerness every day, because the end time will end some day. For the Lord Himself will descend from heaven with a shout, with the voice of the archangel and with the trumpet of God, and the dead in Christ will rise first. Then we who are alive, who are left, will be caught up together with them in the clouds to meet the Lord in the air, and so we will always be with the Lord. (1 Thessalonians 4:16-17). Eschatology often gets a bad reputation as a doctrinal field of study because of the plethora of ‘theologians’ who either dismiss it entirely in dusgust, or who set dates, add newspaper eisegesis to it, or who are just plain “Kooks & Barneys“, as Pastor Mike Abendroth says. For some reason this field draws out the less solid teachers. Other Christian fields of study such as Pneumatology, Hamartiology, Theology Proper / Paterology, Christology, Bibliology, Soteriology, and Ecclesiology don’t seem to draw out the kooks as much. Apologies to those of you who ARE solid expounders of ‘last things’! But it’s true. Eschatology gets a bad rap and quite often, it’s warranted. I’ve noticed in the last ten years that it seems to be to be a low point in Eschatological study, maybe because of different -ologies falling in and out of favor. However in these last few weeks I’ve noticed credible ministries teaching on it. The Master’s Seminary had a series recently, from which I captured this screen shot from Dr. Nathan Busenitz teaching an introductory lesson to his series. 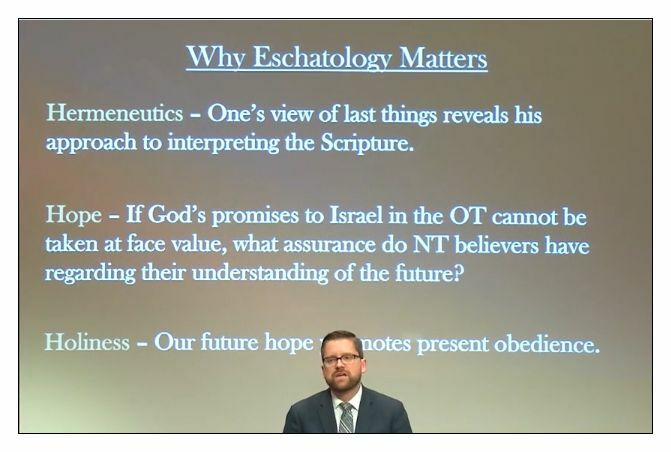 One of the important reasons to study Eschatology is because as is stated below, one’s view of last things reveals one’s approach to interpreting scripture. I hope Eschatology as a Christian field of doctrinal study and preaching is making a comeback. Meanwhile please bookmark these three resources and enjoy their offerings so far on eschatology!